By Mohammad Jeprie in Photoshop. Updated on November 15, 2018 . We will make the text manually in Adobe Illustrator, then import its path to Adobe Photoshop and apply some effects and texture. 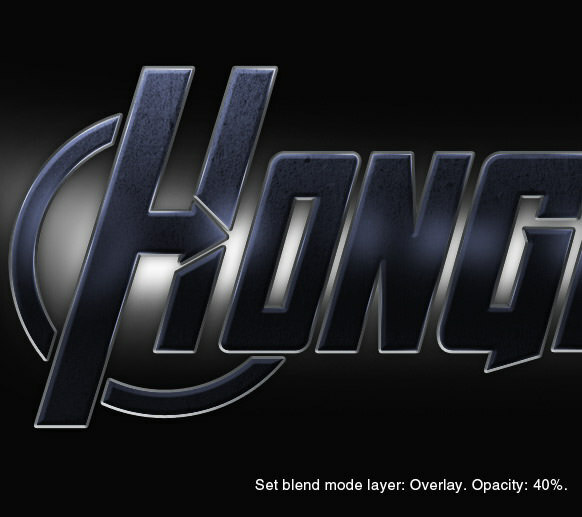 Instead of “Avengers”, we will use “Hongkiat” as the text, or you can use any text you please. 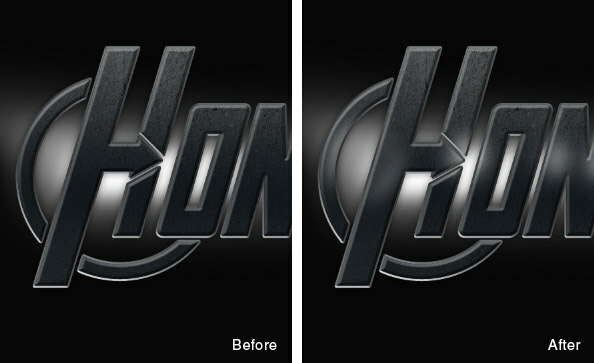 Recommended Reading: More Photoshop Text Effects! Let’s start with working on its characters. Our first option is using a free font type. 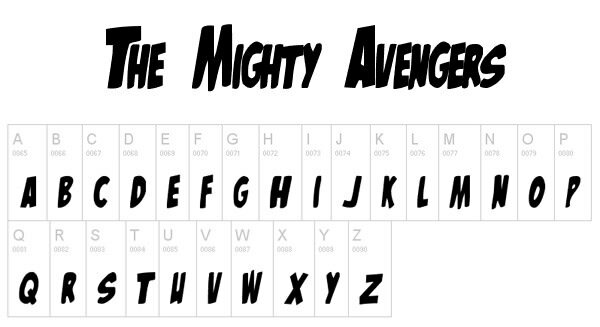 After searching in google using keyword "free fonts Avengers", I found two fonts with Avengers theme, The Avengers and The Mighty Avengers. Both are made by Owen Dawson. Unfortunately, both do not have the complete alphabet for our project. 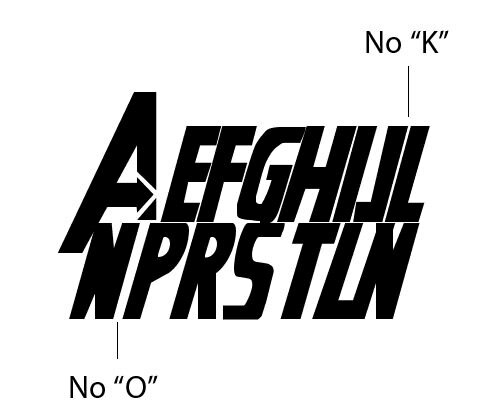 First font has no K and O. 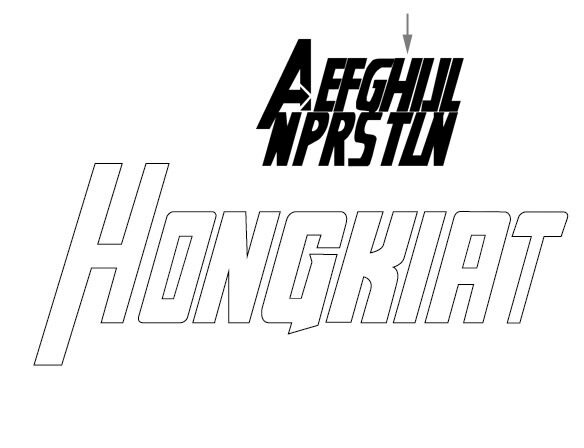 We need these two characters in "Hongkiat". 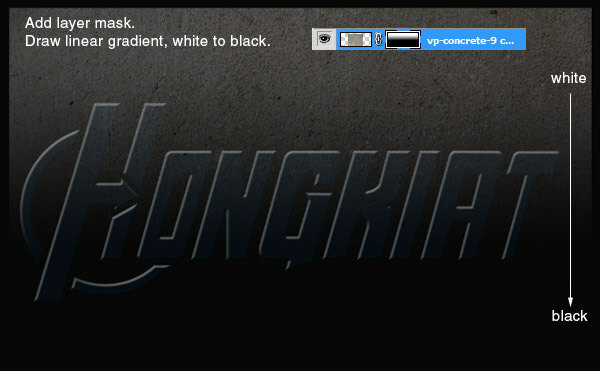 Also, we cannot use its A character because it is not suitable if used between letters, such as in "Hongkiat". 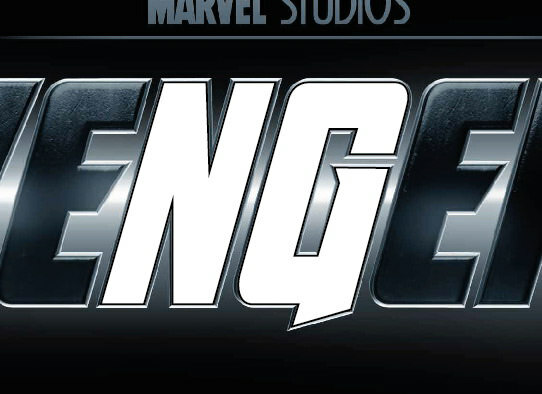 Second font seems to be based from The Avengers original comic. It has round edges instead of sharp edges. 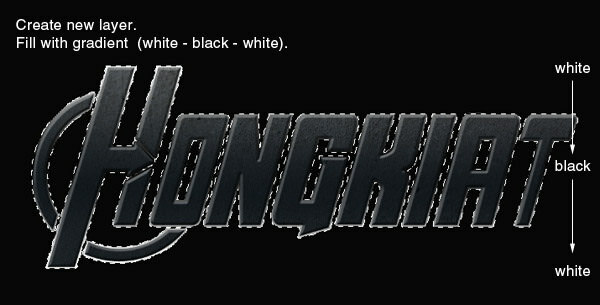 This font style is different from its movie poster. So, our best option is to draw the characters manually. We are not going to use these fonts but they will be useful for our reference while creating the characters. You should start googling for The Avengers. This is what I use for our reference. Save the image file, create new file in Adobe Illustrator, then paste the file. Click Object > Lock > Selection to lock image and prevent it from being edited accidentally. 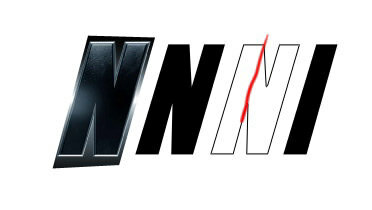 In current "AVENGERS" text, we can find N and G which is used in "HONGKIAT". Make new layer, then use pen tool to trace character N and G.
For other characters (H, O, K, I, A, and T), we will base it from other available characters. 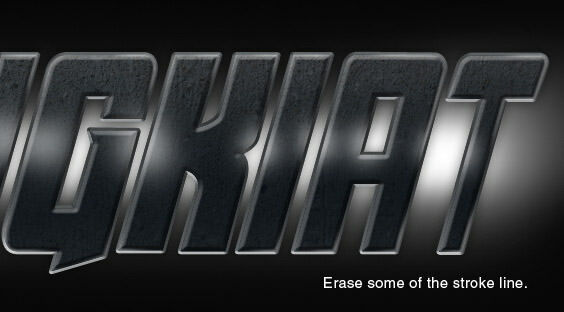 For I, we use the available N character and remove half of it. 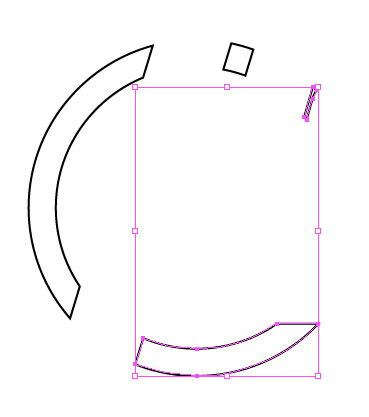 For O, we modify E by closing it and add hole on its center. For K, we can simply modify R by cutting its upper part. We also use R as base character for A. For T, we use A character that we have created earlier. Place all these character into its position. Currently, we have "ONGKIAT". Step 6: Draw First Character "H"
Just as in the reference image, first character is very tall compared to the others. 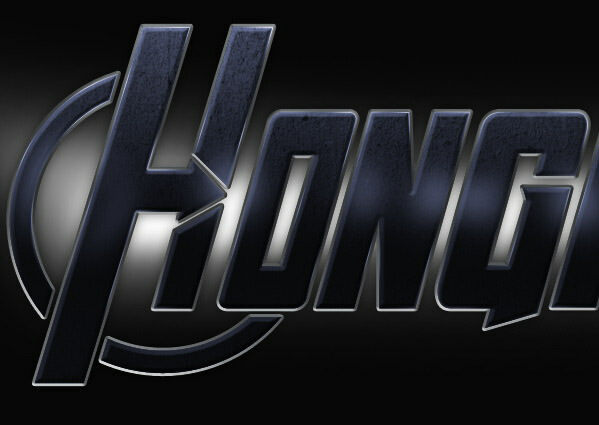 For the H, we can use reference from preview font The Avengers. Draw two circles from same origin. 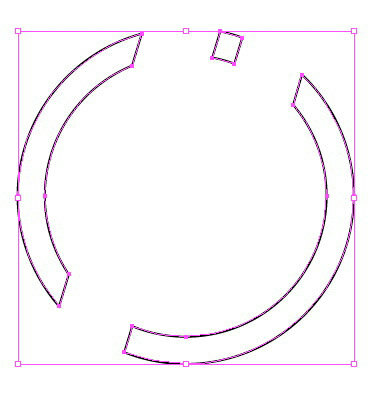 Select both circles, open Pathfinder panel and select Subtract to create a ring shape. 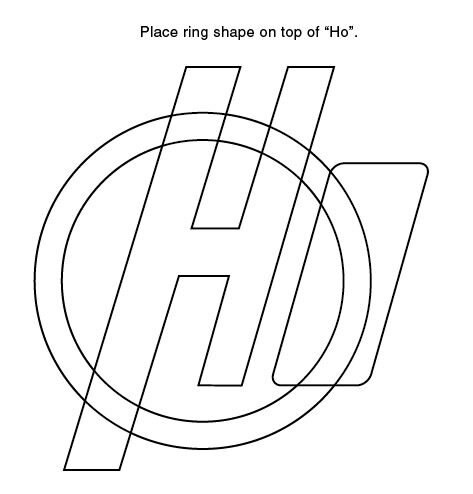 Place ring shape on top of H and O character. Note: To help us see better, I will remove unused paths from sight. Select "Ho" characters, click Object > Path > Offset Path. 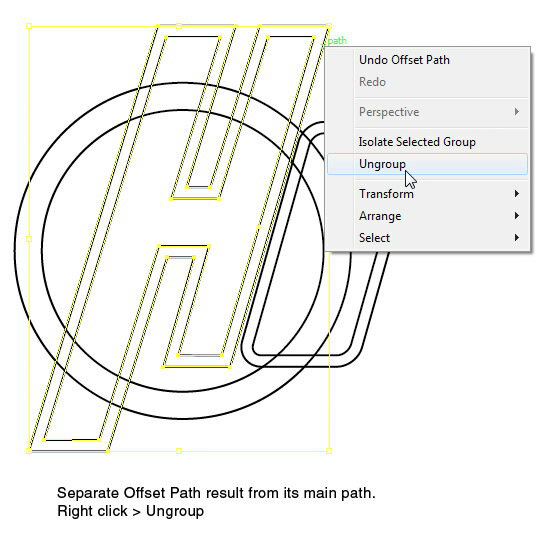 Right click H and select Ungroup to separate Offset Path from its main path. Repeat this process to O. 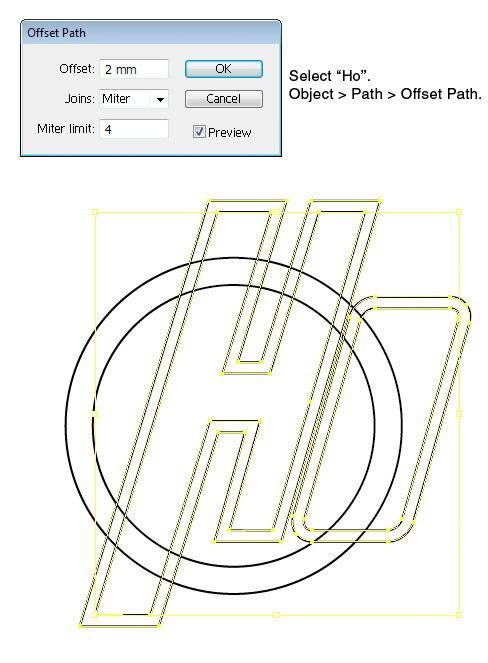 Place big H on top of ring shape by clicking Object > Arrange > Bring to Front. 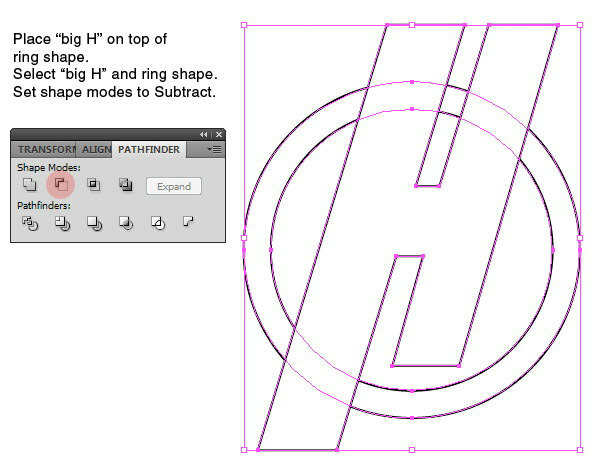 Select big H and ring shape, then select Subtract on Pathfinder panel. 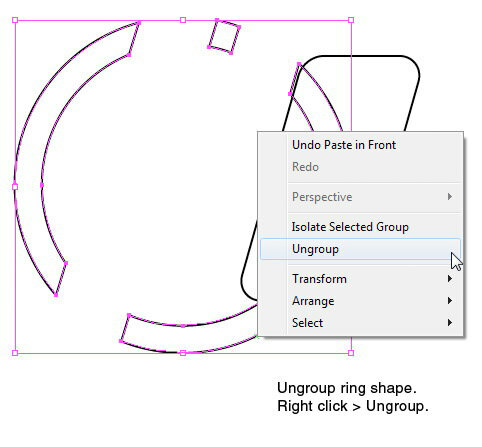 Right click ring shape and select Ungroup. 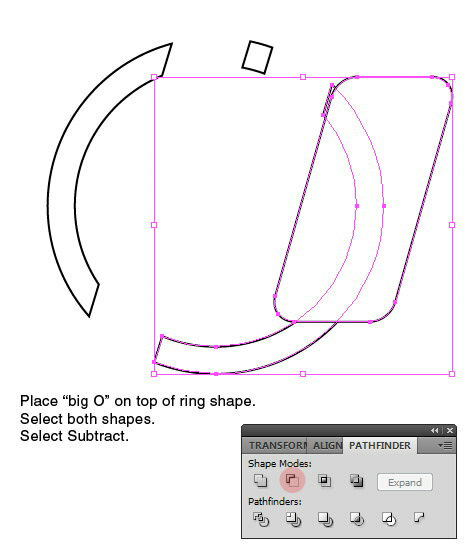 Place big O on top of ring shape by clicking Object > Arrange > Bring to Front. Select big O and the ring shape underneath it. 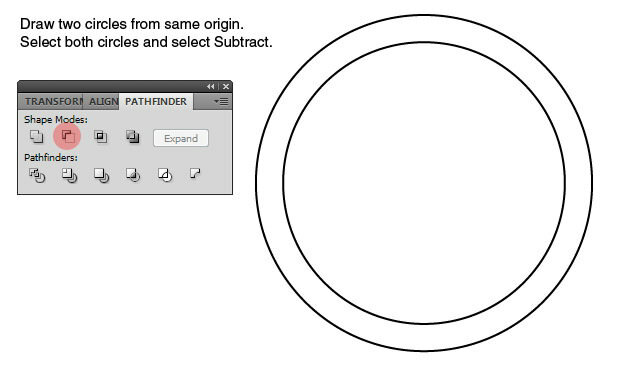 From the Pathfinder panel select Subtract. Delete remaining parts of the ring that are unused. This the complete preview on our current path. 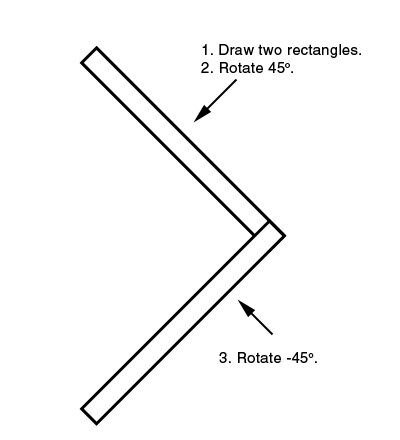 Draw two rectangles, then rotate them 45° and –45°. Position both shapes until we get an arrow shape. 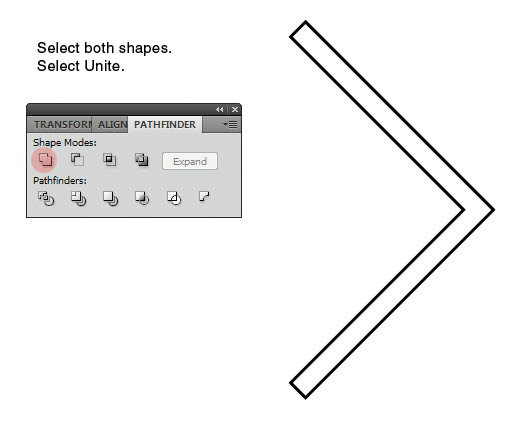 Select both shapes and select Unite from Pathfinder panels. 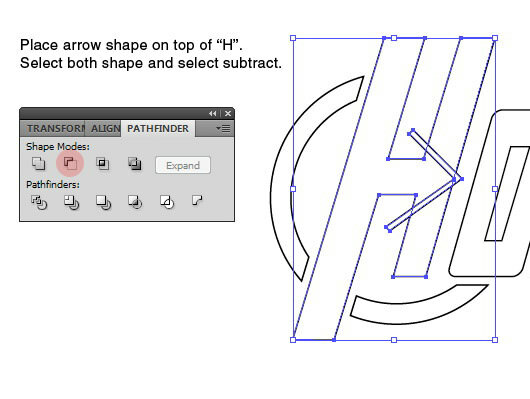 Place arrow on top of H character. See picture below for its placement. Select both shapes and select Subtract. 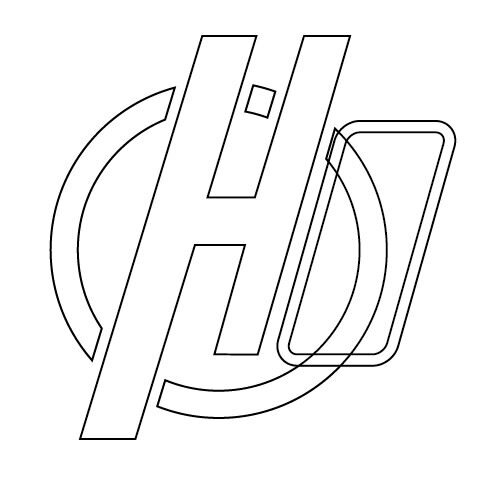 Now, we have an arrow hidden inside the H character. This text is now ready to be used. Open Photoshop. 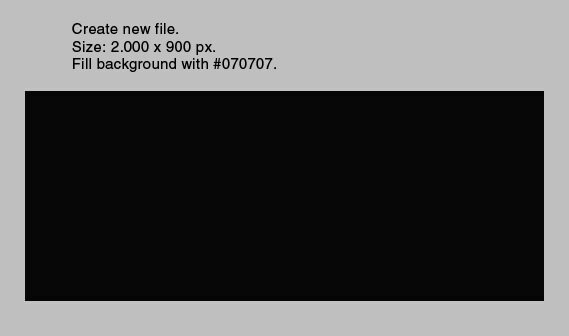 Make a new file with size: 2000 px × 900 px. Fill background with color: #070707. Return to Illustrator. Select all character paths and then hit Ctrl + C to copy it into clipboard. 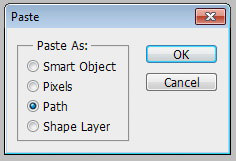 In Photoshop, hit Ctrl + V. Paste text as path. 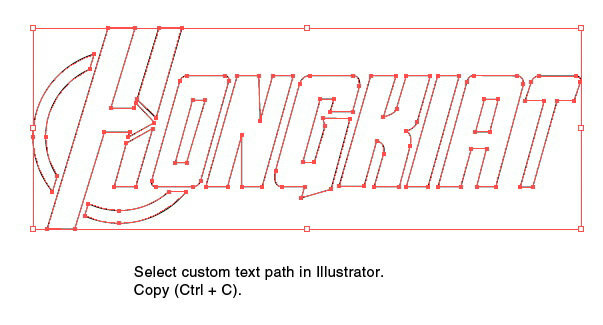 Text from Illustrator is placed as a new path. You can find it on Paths panel. Select path inside O and A. In option bar, set its mode to Subtract. This mode will make both paths create holes inside their main path. Click black and white circle in Layers panel. Select Solid Color, set its color to #070c12. Now, we have new shape based on the imported paths. 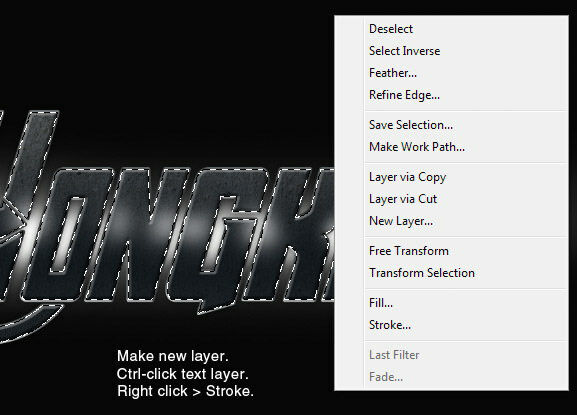 Double click layer to open Layer Style dialog box. Add Bevel and Emboss. Select Technique: Chisel Hard to get hard edges. This is our current result. 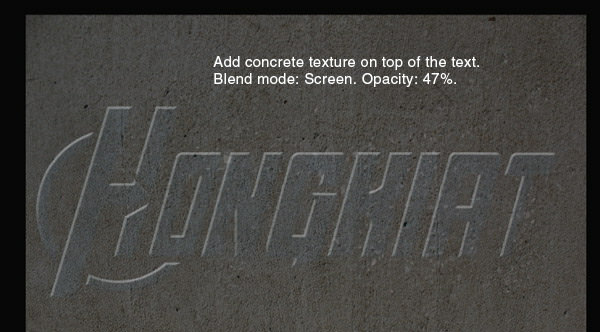 Add concrete texture and place it on top of the text. 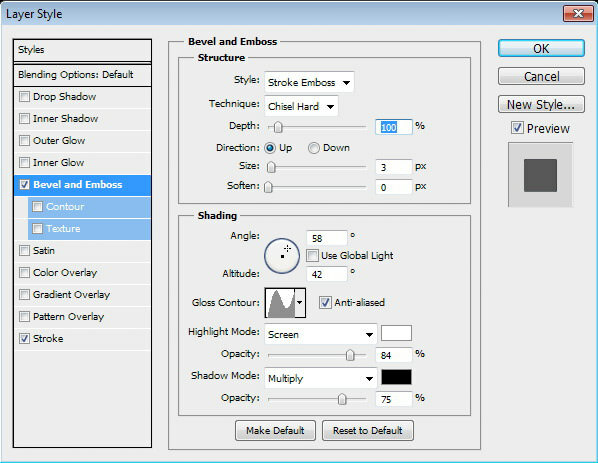 Set its blend mode to Screen and reduce its Opacity to 47%. Add layer mask. Draw linear gradient from white to black. 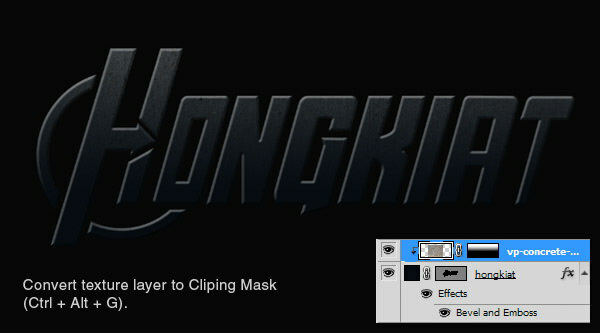 Hit Ctrl + Alt + G to convert texture into Clipping Mask. The texture now goes inside the text. The texture is currently faded in lower part of the text. Let’s reveal some of them there by painting that area with white using brush with Opacity 30%. Below, you can see layer mask after painting those areas. This is the result. You can see that now there’s a subtle texture on lower part of the text. Duplicate text and paste it behind the original text layer. Add Layer Style: Stroke. Below, you can see that the result is just a flat color stroke line. 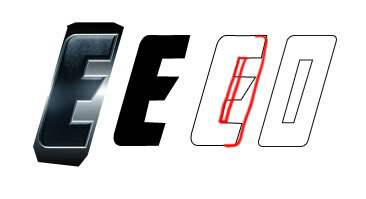 Let’s add Bevel and Emboss and set its Style to Stroke Emboss. This way, the effect is also applied to the Stroke we have just added. Now, the stroke has Emboss appearance. Add Outer Glow to add subtle shadow behind each character. Currently, we will not be able to see its effect because the background is still too dark. 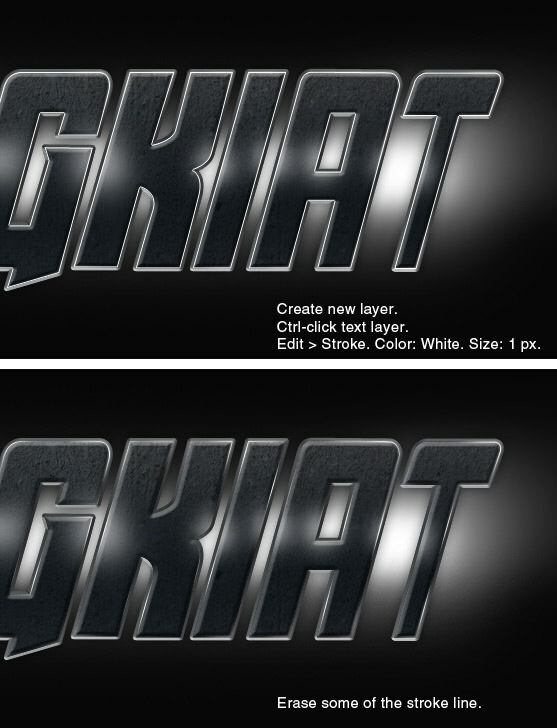 Create new layer above text with stroke effect. 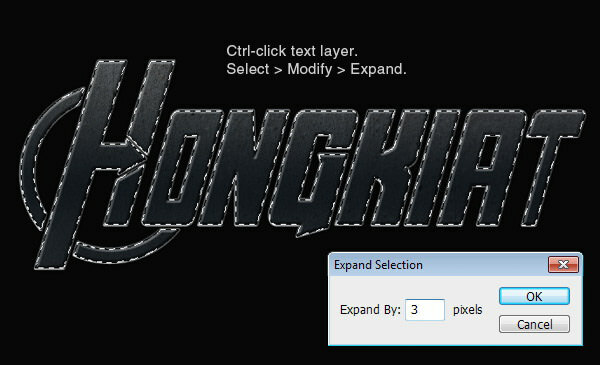 Press Ctrl and click on text layer. Click Select > Modify > Expand. Set Expand by 3 pixels. 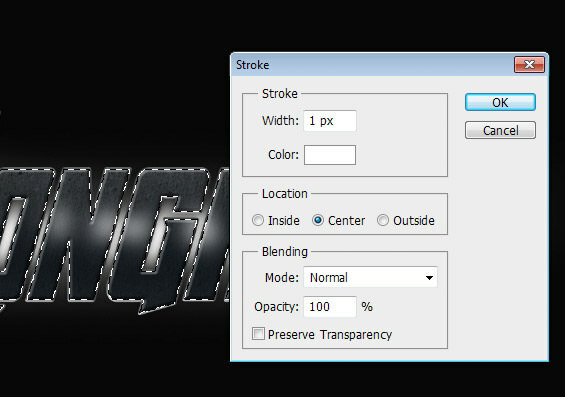 Notice that we expanded selection for 3 pixel so it matches the stroke size. Fill selection with a linear gradient from white to black to white. Set its blend mode to Overlay. 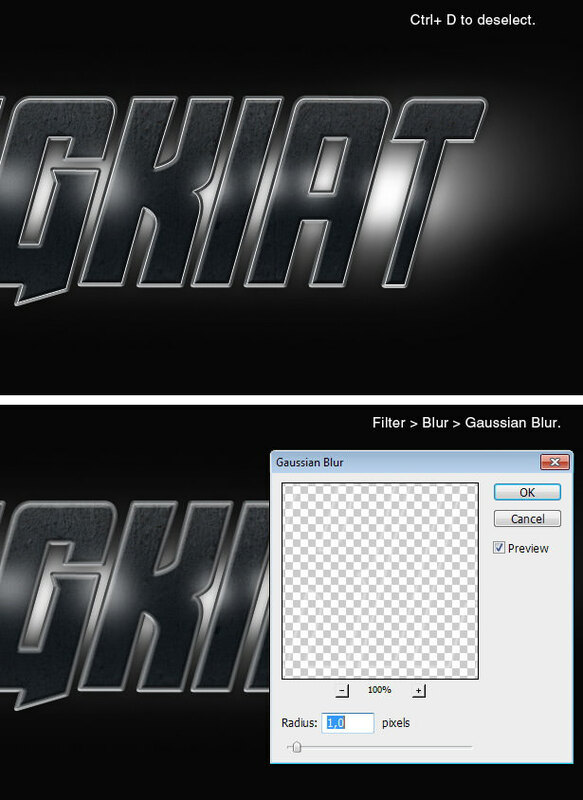 Reduce Opacity to 30%. Create new layer under the text. 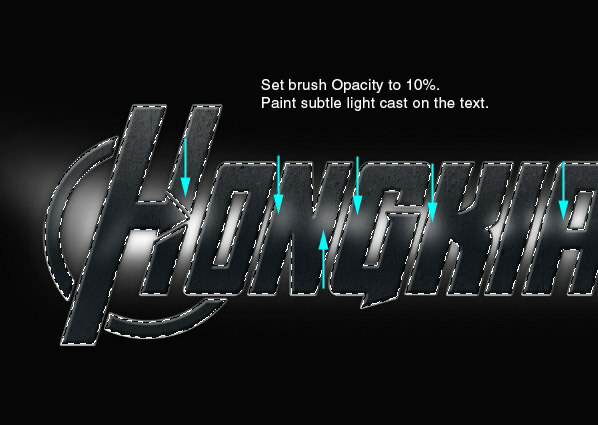 Activate Brush tool and set its Opacity to 100%. Draw white line behind the text. 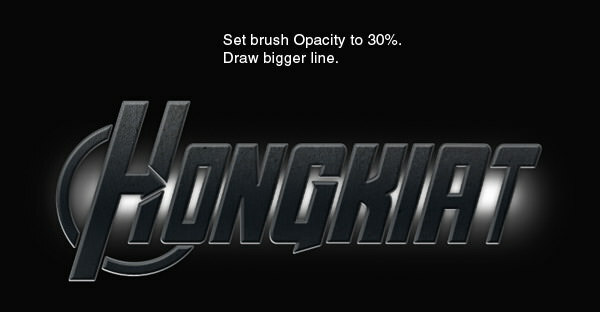 Reduce brush’s Opacity and draw bigger line covering the first line. Paint random light cast on line’s edges. 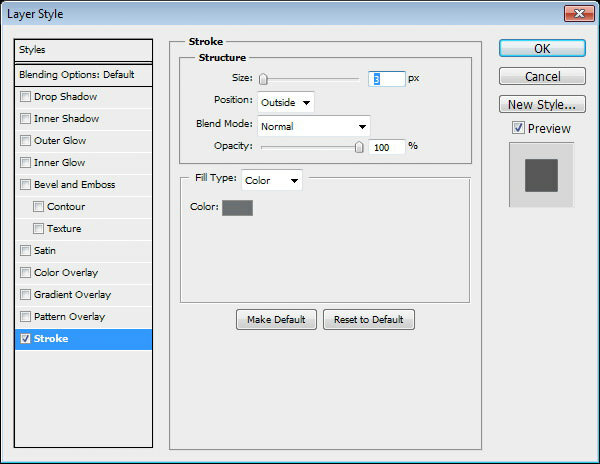 Press Ctrl and click on text layer to create new selection based on text shape. Make new layer and place it on top of main text. 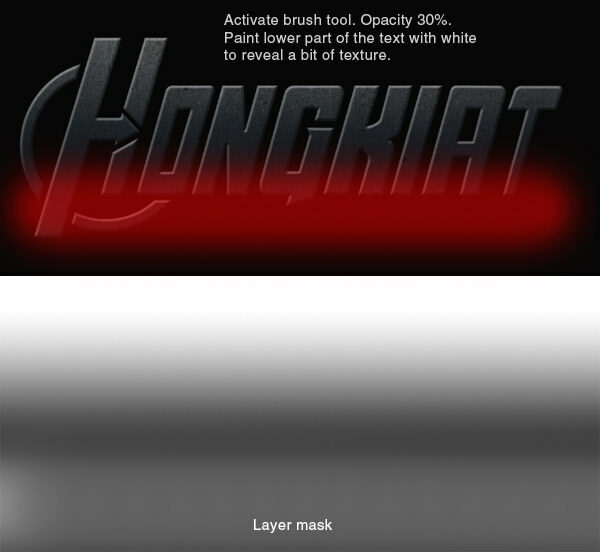 Activate Brush tool, set its Opacity to 10%. 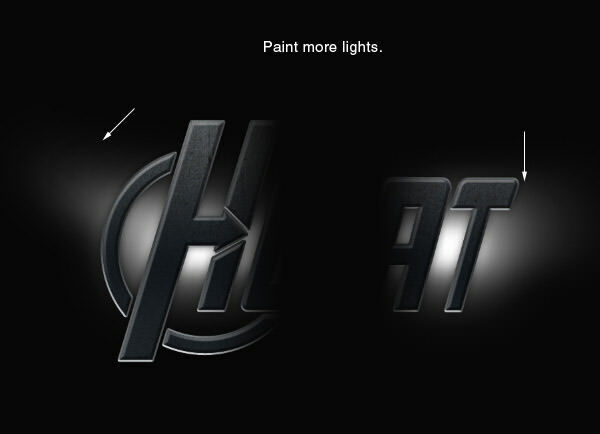 Paint some whites on middle of the text as like the light cast is from behind. Below, you can see the result before and after adding light cast. Make new layer again. Place it on top of text. Right click and choose Stroke. Select white color, Width: 1 px. Hit Ctrl + D to remove selection. Apply Gaussian Blur to soften the stroke line. Erase some of the stroke lines. These lines become highlight on the text shape. 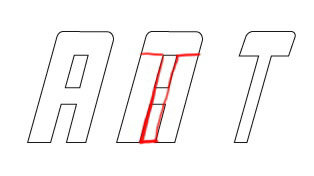 Draw another stroke line again on new layer. Erase some of it to act as sharper highlight. 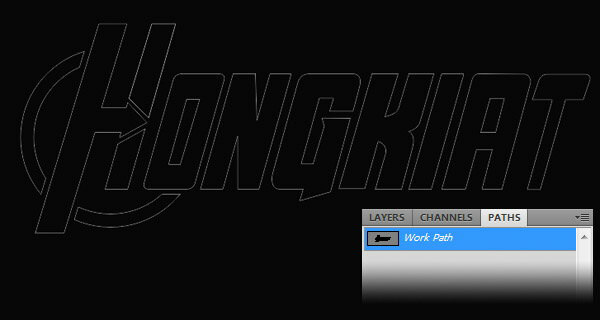 Make new layer and fill it with linear gradient, white to black. Press Ctrl and click on text layer. 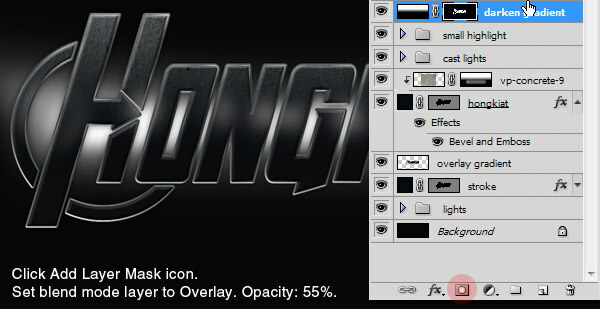 Add layer mask by clicking Add Layer Mask icon on Layers panel. Set blend mode to Overlay and reduce its Opacity to 55%. Again, press Ctrl and click on text layer. Add Adjustment layer Hue/Saturation. 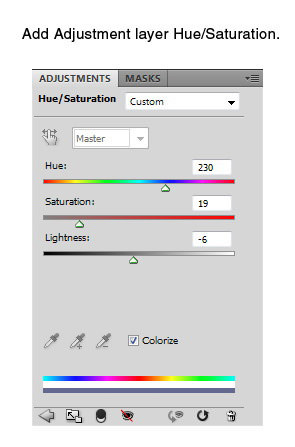 Use setting below and make sure to activate Colorize option. Here’s the result on the text. Make new layer. 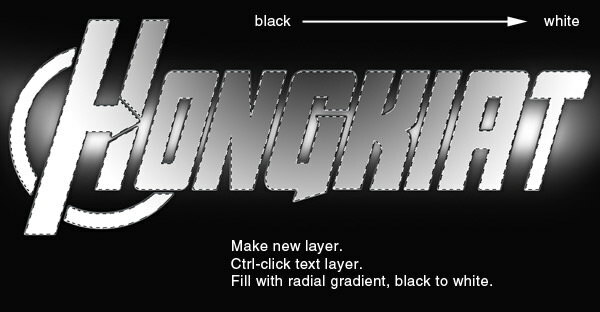 Press Ctrl and click on text layer then fill selection with radial gradient from black to white. 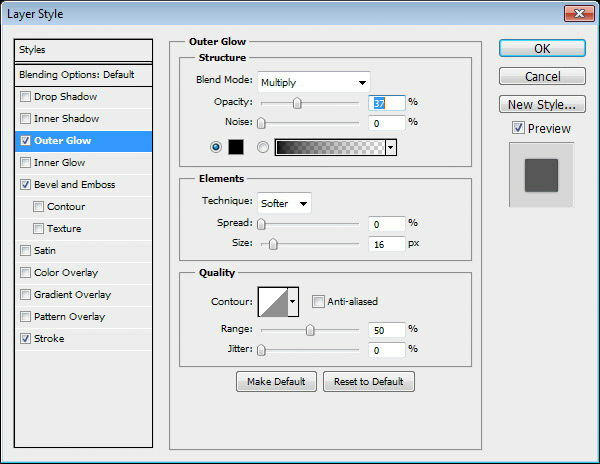 Set blend mode to Overlay then reduce its Opacity to 40%. 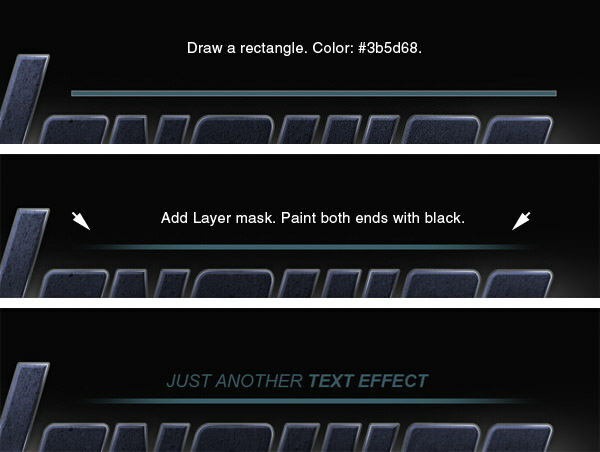 Draw a thin rectangle on top of the text with color: #3b568. Add Layer Mask, then paint both ends with black. Add subtitle above the rectangle. We’re done! Below is the result of our tutorial. Click on the image to see it in full size. I hope you enjoy this tutorial and learned some new techniques. If you have any questions, feel free to ask.